Perhaps the most striking development in tax policy throughout the world over the last few decades has been the decline in corporate income tax rates. Between 1985 and 2018, the global average statutory corporate tax rate fell by more than half, from 49% to 24%. Why are corporate tax rates falling? The standard explanation is that globalisation makes countries compete harder for productive capital. By cutting their rates, countries can attract more machines, plants, and equipment, which makes workers more productive and boosts their wage. This theory is particularly popular among policymakers. It permeates much of the discussion about tax policy, for instance the decision by the US to cut its corporate tax rate from 35% to 21% in 2018 (e.g. Council of Economic Advisors 2017). But is it well founded empirically? Today’s largest multinational companies don’t seem to move much tangible capital to low-tax places – they don’t even have much tangible capital to start with. Instead, they avoid taxes by shifting accounting profits. In 2016 for instance, Google Alphabet made $19.2 billion in revenue in Bermuda, a small island in the Atlantic where it barely employs any worker nor owns any tangible assets, and where the corporate tax rate is zero percent. In a recent paper (Tørsløv et al. 2018) we argue that this profit shifting is a key driver of the decline in corporate income tax rates. By our estimates, close to 40% of multinational profits were artificially shifted to tax havens in 2015. This massive tax avoidance – and the failure to curb it – are in effect leading more and more countries to give up on taxing multinational companies. The decline in corporate tax rate is the result of faulty policies in high-tax countries, not a necessary by-product of globalisation. Our estimate that 40% of multinational profits are shifted to tax havens is based on new macroeconomic data known as foreign affiliates statistics.These statistics record the amount of wages paid by affiliates of foreign multinational companies and the profits these affiliates make. In other words, they allow to decompose national accounts aggregates (wages paid by corporations, operating surplus of corporations, etc.) into ‘local firms’ and ‘foreign firms’. We draw on these statistics to create a new global database recording the profits reported in each country by local versus foreign corporations. This enables us to have the first comprehensive map of where profits are booked globally. Using this database, we construct and analyse a simple macro statistic: the ratio of pre-tax corporate profits to wages. Thanks to the new data exploited in our paper, we can compute this ratio for foreign versus local firms separately in each country. Our investigation reveals spectacular findings. 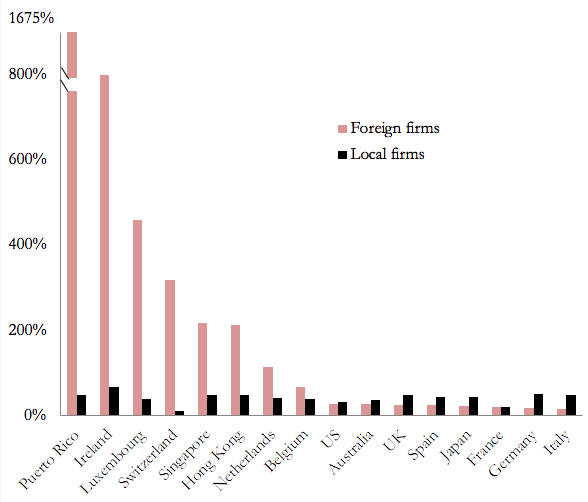 In non-haven countries, foreign firms are systematically less profitable than local firms. In tax havens, by contrast, they are systematically more profitable – and hugely so (Figure 1). While for local firms the ratio of taxable profits to wages is typically around 30%-40%, for foreign firms in tax havens the ratio is an order of magnitude higher – as much as 800% in Ireland. This corresponds to a capital share of corporate value-added of 80%-90% (compared with around 25% in local firms). To understand these high profits, we provide decompositions into real effects (more productive capital used by foreign firms in tax havens) and shifting effects (above-normal returns to capital and receipts of interest). The results show that the high profits-to-wage ratios of tax havens are essentially explained by shifting effects. Overall, we find that close to 40% of multinational profits – defined as profits made by multinational companies outside of the country where their parent is located – are shifted to tax havens in 2015. Our work provides transparent, easy-to-compute metrics for policymakers to track how much profits tax havens attract, how much they gain in tax revenue, and how much other countries lose. These statistics, which we will update regularly online, could be used to monitor the impact of the policies implemented to reduce tax avoidance. We then trace the profits booked in tax havens to the countries where they have been made in the first place – and would have been taxed in a world without profit shifting. This allows us to provide the first comprehensive view of the cost of profit shifting for governments worldwide. We find that governments of the EU and developing countries are the prime losers of this shifting. Tax avoidance by multinationals reduces EU corporate tax revenue by around 20%. When we look at where the firms that shift profits are headquartered, we find that US multinationals shift comparatively more profits than multinationals from other countries. This can be explained by the specific incentives contained in the US tax code before 2018 and by US Treasury policies implemented in the 1990s that facilitated this shifting (Wright and Zucman 2018). Why, despite the sizable revenue costs involved, have high-tax countries in Europe, developing countries, and the rest of the world been unable to protect their tax base? We show theoretically that the fiscal authorities of high-tax countries do not have incentives to combat shifting to tax havens, but instead have incentives to focus their enforcement effort on relocating profits booked by multinationals in other high-tax countries. Chasing the profits booked in other high-tax places is feasible (the information exists), cheap (there is little push-back from multinationals, since it does not affect much their global tax bill), and fast (a framework exists to settle disputes between high-tax countries quickly). This type of enforcement crowds out enforcement on tax havens, which is hard (little data exist), costly (as multinationals spend large resources to defend their shifting to low-tax locales), and lengthy (due to a lack of cooperation by tax havens). Consistent with this theory, our analysis of data on tax disputes between tax authorities shows that the vast majority of high-tax countries’ enforcement efforts are directed at other high-tax countries. In effect, non-haven countries steal revenue from each other while letting tax havens flourish. This policy failure is reinforced by the incentives of tax havens. By lightly taxing the large amount of profits they attract, tax havens have been able to generate more tax revenue, as a fraction of their national income, than the US and non-haven European countries that have much higher rates. The low revenue-maximising rate of tax havens can explain the rise of the supply of tax avoidance schemes documented in the literature – such as favourable tax rulings granted to specific multinationals – and in turn the rise of profit shifting since the 1980s. Our findings have implications for economic statistics. They show that headline economic indicators – including GDP, corporate profits, trade balances, and corporate labour and capital shares – are significantly distorted. The flip side of the high profits recorded in tax havens is that output, net exports, and profits recorded in non-haven countries are too low. We provide a new database of corrected macro statistics for all OECD countries and the largest emerging economies. Adding back the profits shifted out of high-tax countries increases the corporate capital share significantly. By our estimates, the rise in the European corporate capital share since the early 1990s is twice as large as recorded in official national account data.This finding has important implications for current debates about the changing nature of technology and inequality (e.g. Piketty and Zucman 2014, Karabarbounis and Neiman 2014). Our work provides concrete proposals to improve economic statistics and the monitoring of global economic activity. Karabarbounis, L and B Neiman (2014), “The Global Decline of the Labor Share”, Quarterly Journal of Economics 129(1): 61-103. Piketty, T and G Zucman (2014), “Capital is Back: Wealth-Income Ratios in Rich Countries 1700-2010”, Quarterly Journal of Economics 129(3): 1255-1310. Tørsløv, T, L Wier, and G Zucman (2018), “The Missing Profits of Nations”, NBER Working Paper 24701. Wright, T, and G Zucman (2018), “The Exorbitant Tax Privilege”, working paper.